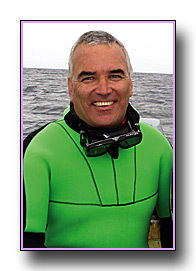 Australian Jeff Mullins is the designer and producer of the Underwater Camera Housing Leak Detector. He is an underwater photographer himself, with over 40 years of experience with both film and digital formats. He is also an electronics technician who has built and maintained his own underwater strobes and accessories, plus repaired and serviced housings for over 30 years. Jeff is an underwater photo-journalist who has self-published two books; Dive Western Australia and Reef Wreck & Critter - Tulamben. He has also contributed regular features to; Dive Log Australasia, Sportdiving Magazine, Underwater Photography Magazine, Garuda Inflight, Hello Bali Magazine & various other dive and travel publications. Jeff conducts one on one Digital Underwater Photography Courses in Tulamben, Bali and escorts Live-Aboard Photo Trips to the Komodo Islands, Raja Ampat & Cenderawasih Bay plus other destinations in Indonesia. We also sell a range of Underwater Photo Accessories including wet macro lenses, swing away macro lens mounts, fibre optic snoots, LED focus lights, base plates and strobe arms. Visit our other website ReefWreckandCritter.com for more information, or subscribe to our Blog Site to see what we are seeing underwater. You can also connect with us on Facebook to see what we are currently doing .